Wick Buildings roll forms the steel to be used on your building to assure the quality of the steel. Many years of research and testing has resulted in a product of top quality when it comes to steel covering on your building. 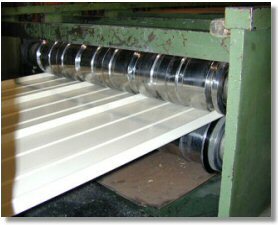 Wick Buildings roll forms trim In house to assure the quality of trim used on your building. 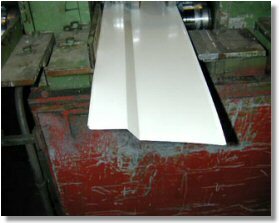 All the trim is also hemmed on the edges to assure a better look and reliable finish to your building. Through years of research and development Wick Buildings has proved beyond a doubt that screws vs. nails is a superior method to attached steel panel to wood framing. Therefore screws are used to attached all steel panel and trim on Wick Buildings. This is just one more way that you can be assured that you are purchasing the best design and construction that is offered in the wood frame building Industry today! All of Wick Buildings trusses are designed by Wick professional engineers and are manufactured by Wick In house. This design and in house manufacturing assures you of a high quality finish product to be used in your building. All of Wick Buildings laminated columns are fabricated In house. This in house fabrication of columns gives assurance of quality control. The importance of quality as it relates to laminated columns is monumental in the overall strength and design of your post frame buildings. All of the roof load and wind load of a properly designed post frame building is transferred into the laminated columns. Wick Buildings can assure you these laminated columns are of the highest standard and quality fabrication in the post frame building Industry. Copyright © 2006 - 2012 by Path Construction, Inc.
"We were impressed with the speed and quality of the building crew. We could not have asked for any better. The building materials were excellent, especially the ease of opening and closing the sliding doors."